It’s summertime. The tumult of your classroom has faded and you’ve gotten in at least one good beach day and an afternoon (or three) curled up with a long neglected book. September seems far away… but not that far. You don’t want to think about the kids running around, endless bulletin boards, diving into lesson planning, or most of all the piles of paperwork and grading awaiting you in September. Or do you? What if it could be different next year? What if grading was a pleasure, instead of a chore? What if you didn’t have to manually enter all those scores into your gradebook afterwards? What if you automatically got reports in your inbox or on your phone that helped you decipher what your students understood and didn’t understand, without any additional work on your part? What if exit tickets were easy — and free? We think summer is the perfect time to try a new tool. That’s why Gradeable is free for the summer. Sign up for our beta and try it out. The secret handshake (also known as the invite code) is “SummerOfFreedomBL”. 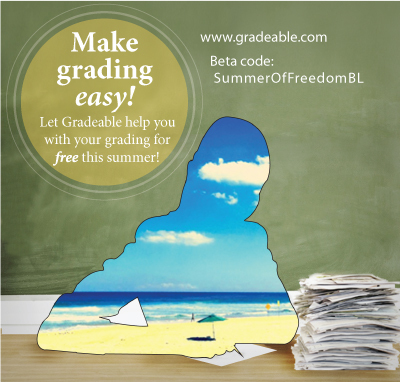 If you know a summer school teacher, be sure to let them know that Gradeable could be perfect for them too. Enjoy your next iced tea, your next tennis game, your next nap on the beach. Do some summer dreaming. If nothing else, just daydream about the idea that next year could be different…. just planting a seed. Enjoy your summer! Happy Monday! We’ll start you off with an excellent Edudemic video which takes an in-depth look at a middle school just a few miles away from our office at MIT. Edwards Middle School in Charlestown has had tremendous success with their extended school day, and this video will show you why. Amrita Sahni, director of instruction at Edwards Middle School in Boston, writes that lengthening the school day was “one of the best things we could have done to help reform our school model and improve student outcomes.” The schedule — three extra hours of school time four days a week, and half-days on Fridays — led to improved academic achievement and engagement. She also lists several tips to make expanded learning time successful, including getting buy-in from students, unions and educators. There is no system in the world or any school in the country that is better than its teachers. Teachers are the lifeblood of the success of schools. But teaching is a creative profession. Teaching, properly conceived, is not a delivery system. You know, you’re not there just to pass on received information. Great teachers do that, but what great teachers also do is mentor, stimulate, provoke, engage.